A small moth, with a wingspan of approximately 15mm. 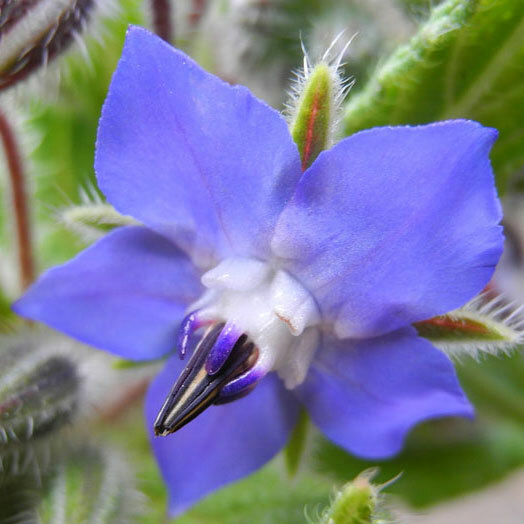 Originally from Australia, it was first found in New Zealand in Northland in 1997. Over the last few years it has become more of a problem in Auckland and can also be found further south. The moths lay their eggs on to a wide range of fruit and nuts, including: guava, feijoa, citrus, apples, peaches, pears, plums and peppers. 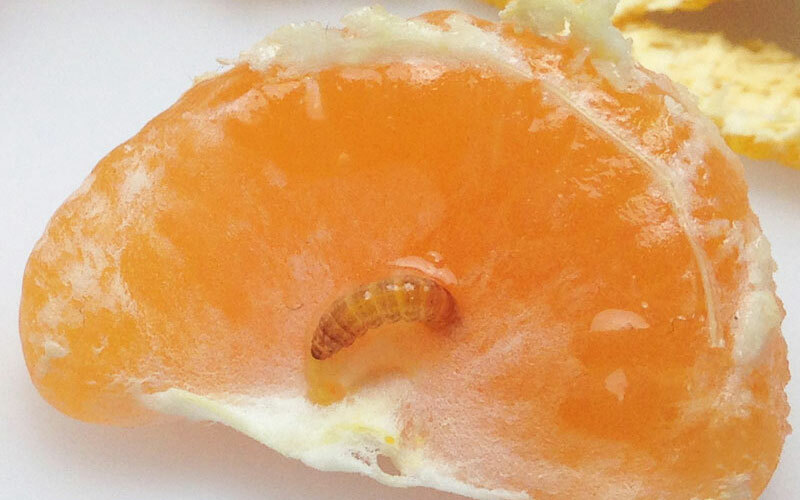 After hatching, the larvae burrows into fruit. They have also been known to infest the inedible fruit of Eugenia hedging. A pin-prick sized hole from the larvae burrowing in can sometimes be seen. The damage is somewhat similar to that caused by codling moth and the two can be confused for one another. Unlike codling moth, guava moth can breed all year round. Signs to look out for include: premature fruit drop, exit holes or small discolouration, fruit may appear bruised, during the later stages the larvae’s excrement may be visible. When tackling the problem it’s worth coordinating with neighbours to help avoid the build up of severe infestations. 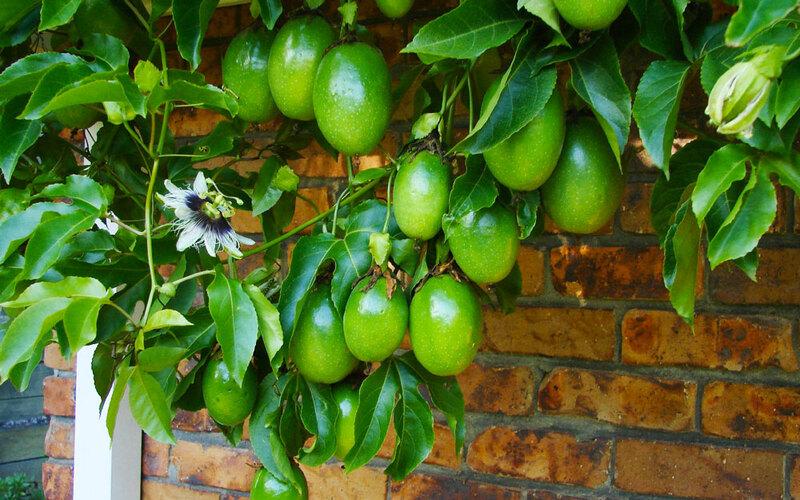 Prevent the moth from laying their eggs on the fruit by draping Bug Net over the tree and pinning it to the ground. Alternatively you can cut the net into sections and wrap around fruit. Note: Wait till after flowering before covering the trees to allow pollination. Current methods of control are somewhat limited. Use multiple methods for best results, and if possible coordinate with your neighbours. We also welcome any feedback that can help us improve our recommendations. 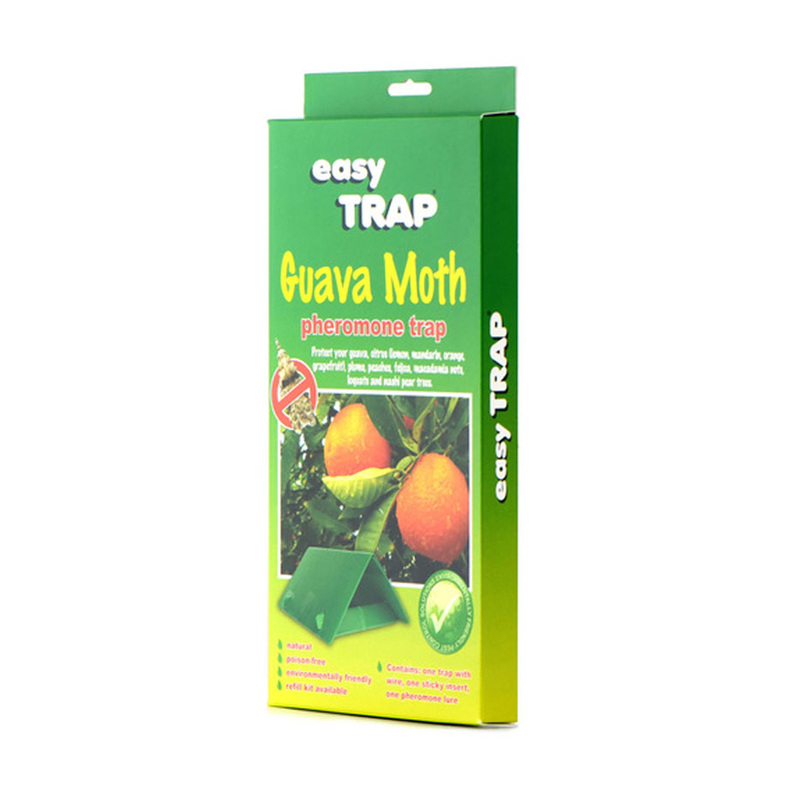 Monitor numbers or solve low-level infestations with Guava Moth Traps. The traps use a pheromone scent akin to that in a scent released by the female moths to attract the males. 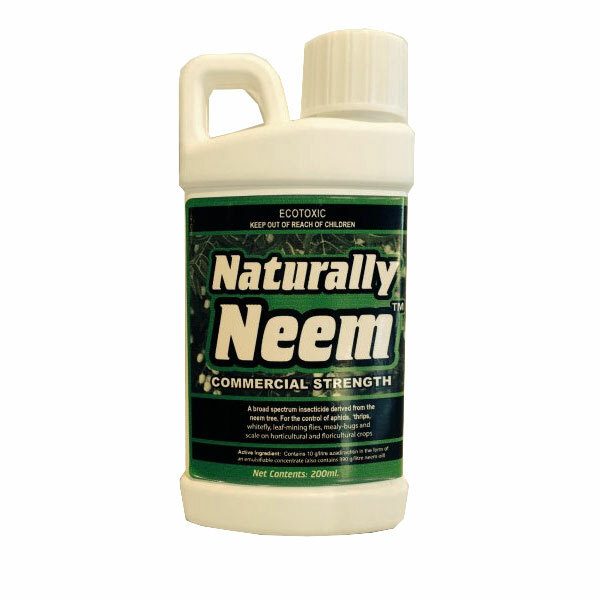 If you are catching 5 or more moths over a two week period spray with Neem Oil twice a week on and around fruit until you stop catching the moths. Be especially vigilant when the fruit first starts to form as this is when the moths tend to lay their eggs. Another effective method of control is to use the Little Bugga Guava Moth Trap. Unlike the pheromone trap it will catch female moths along with other species of moths, including codling moth. 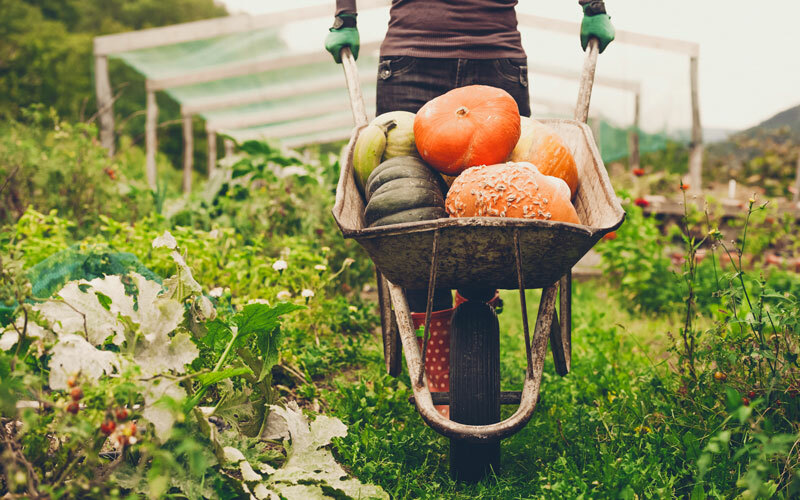 Remove infected fruit and dispose of carefully to avoid spreading the larvae, avoid composting it on your property. If you have chickens, fencing them in around your fruit trees will also help kill the grubs as they pupate in the soil. 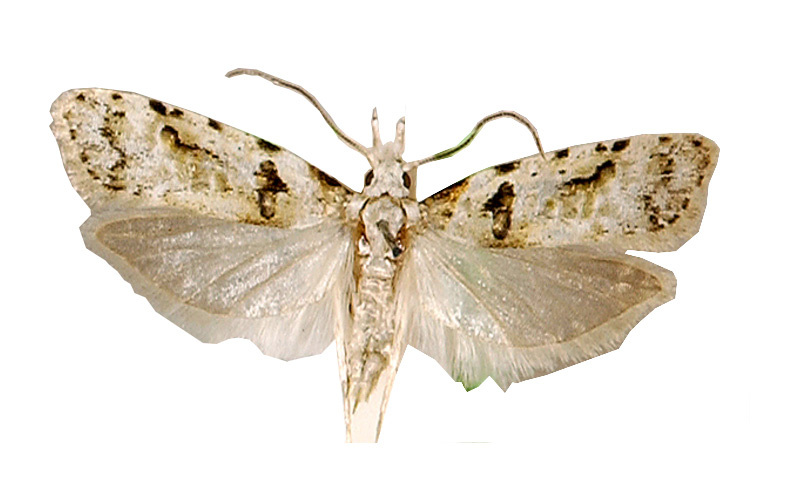 Naturally attracts the moth by using a pheromone lure then traps them before they damage your fruit.